Brunswick County has hired Edward Conrow as its Director of Emergency Services. 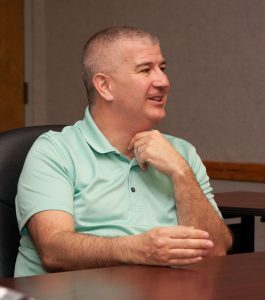 With decades of experience in emergency management, fire services and search and rescue in New Jersey and New York, Conrow started his new position with Brunswick County Apr. 1. Conrow worked for more than 25 years in fire services, retiring as Chief of the South Jersey Transportation Authority’s Airport Fire Department, and then going to work for county emergency management. He most recently worked as the Director of Emergency Services and Public Protection in Cumberland County, New Jersey, a county along the Delaware Bay coastline with a nearby nuclear plant. He has served on the New Jersey Urban Search and Rescue Task Force 1, including as a Rescue Squad Leader and a Hazardous Materials WMD Specialist, and deployed with that task force to provide search and rescue operations to the World Trade Center on Sept. 11, 2001. He also deployed with the task force to respond to disasters and incidents in other areas, including hurricanes and floods. Conrow had long told his family that one day, he wanted to move to the Southport area, he said. When the job with Brunswick County opened up, he knew he wanted to apply. “I look forward to serving the Brunswick County community by building relationships and providing the highest level of service to those who live in and visit Brunswick County,” Conrow added.